What Shape is Your Swimming Pool? Will it be located near your neighbor's wall? If so, do you need to create privacy? Will large construction equipment be able to access the space without tearing down walls (including your neighbor's)? Is there a power line overhead? While it can be moved, this will add to the cost of your project. Most cities have safety codes. Your pool builder should check and be up on this, as codes can affect the size and shape of a pool. Materials: some types of stone and tile work better applied to geometric forms rather than freeform or curving. Ideally, a pool should have a southwest exposure to allow the maximum amount of sunlight. Think about this when choosing a location. While a smaller version of the local water theme park may be on the drawing board, simpler pool shapes will blend better with a landscape and boost the appeal of your home. Simple geometrics and rectangles can enhance your property's landscaping. Plan the pool size and shape with your contractor before digging further into a project. In the following examples discover just how versatile something as basic as a rectangle can be. Many of the pool featured are award winners, including the Association of Pool and Spa Professionals (APSP) annual Awards of Excellence. A still pool at night that is as beautiful to look at as it is to actually swim in. As a source of exercise, the long, straight lines of a rectilinear pool make sense for pool owners who want to swim laps. Traditionally, reflection pools are rectilinear in shape. Not counting the ancient pools of a few select kings and rulers in places like Babylon and Rome, the history of residential swimming pools pretty much began in Southern California. Starting in the mid-1930s, newsreels and magazine photos of movie stars posing by their swimming pools sparked a trend, which became more popular during the post-World War II housing boom. By 1947, there were 11,000 pools in the United States. The first private backyard swimming pools were rectangular in shape and did not have elaborate wood or flagstone decking or built-in water features. Silent film star Colleen Moore, who posed languidly on her carpeted diving board as she teasingly dipped a finger into her pool, was the quintessential flapper and style icon of the 1920s. Here, she represents everything then-glamorous about the Hollywood lifestyle. Swimming pools come in all shapes, sizes, styles and designs. Some are used for specific purposes: lap pools for health and fitness, infinity pools to make a landscape architectural statement or take advantage of a breathtaking view, novelty pools to express the owner's personality or interests, and naturalistic pools that blend in with the landscape. Materials were matched for all components of this project, which includes a pool, spa, decking, coping, and pergola. Other outdoor features include a fully equipped kitchen, custom fire pit, tennis court, basketball court, large patio, and a cabana. This infinity pool looks like a smooth sheet of glass. The design firm likes to use a technique called "Water in Transit" for infinity overflow pools that are complemented with mood-enhancing features like landscape lighting and fire features. This sprawling, terraced yard in Pennsylvania features a classic rectangular-shaped pool that was built with a raised foundation to make it level with the terrace upon which it was constructed. Beautiful local stone that is stacked gives it an old world look, and the materials are repeated on the steps that flank both sides of the pool and the adjacent spa. A waterfall spills from the main pool into the spa for a dramatic effect. This iconic house perched on a hilltop overlooking Los Angeles is probably one of the most famous examples of mid-century modern residential architecture. Designed by Pierre Koenig, the Stahl House was part of Arts & Architecture magazine's Case Study program which featured notable architects who designed homes using modern industrial materials in the postwar era. Built in 1960, Case Study House 22 used large pieces of glass and dramatic roof overhangs for this modern masterpiece. Photographer Julius Shulman's images--particularly one of two women lounging in the corner window with the LA lights down below—showed the world the design promise and potential of the Stahl and other modern homes of the era. In 2016, the image was named one of Time magazine's "100 Photos: The Most Influential Images of All Time." The rectangular pool complements rather than competes with the home and further emphasizes the beauty of the Southern California lifestyle. This pool area gets a designated spot in an area away from the house, against a shrub and tree-lined wall and adjacent to a similarly rectangular swath of green lawn. Although not a large space, the mature plants provide a relaxing, private getaway. 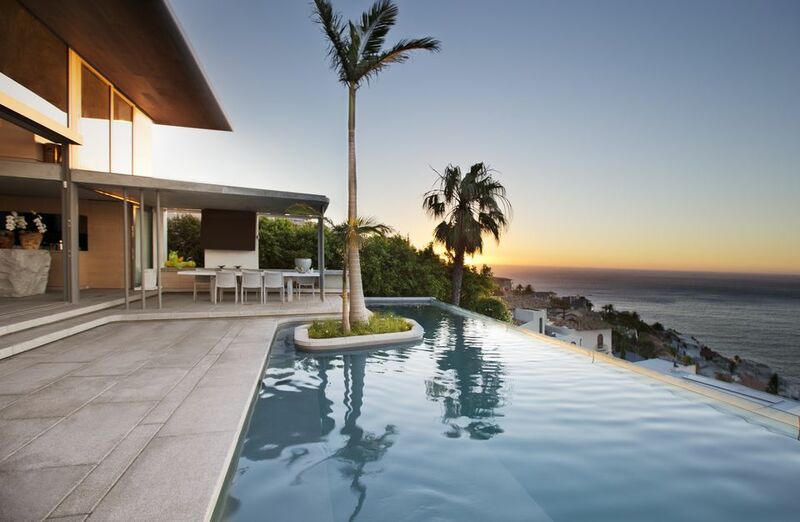 Rectangles are perfect shapes for infinity style pool designs, because they blend with the line of the horizon and take advantage of a view—especially something spectacular like an ocean. A traditional rectangle shape transforms into something different with the addition of squares that cut into it: a connecting spa in the shape of a diamond, along with square pedestals on each corner of the pool. The pool is zero-entry, giving it the appearance of being seamless with the patio surface. A home with desert landscaping uses wood decking that stretches from the house to the pool for an uninterrupted flow. The simple rectangular pool is zero entry and is surrounded by warm colors and materials that reflect the environment. Need inspiration for your pool and landscaping? Consider your decorating style, the home's architecture, environment, and natural landscape. Here, a fire pit seating area reflects the shape of the pool and house, while providing a nice view of everything, including the surrounding landscape. Designed by a Dallas area full-service pool and landscaping firm, this pool shows that a rectangular shape fits nicely on a smaller-sized lot. While the pool is made of concrete, the stone used for the decking and surrounding patio match the house, tying together all elements. Tightly clipped hedges, symmetrical containers of white flowers, bold geometric shapes and placement, and a formal fountain backdrop are all classic design elements centered around a beautiful rectangular pool. This pool environment is located on a sprawling property near Atlanta. Rectangles are perfect for vanishing-edge pools and this one features a large spa that repeats the shape of the pool and is on a slightly higher level, accessible via steps on both sides. Fountains and waterfalls give the pool/spa a dramatic presentation on the edge that drops off from spa to pool, and from pool to the vanishing edge. Materials are used throughout the yard, including the covered outdoor kitchen and patio area for a sense of continuity. A traditional rectangle shape is right at home in this formal outdoor environment that uses cut stone placed into diagonally-placed square pavers, evenly spaced and interplanted with grass. Adding to that formality, the pool is surrounded by more stone and pillars that hold fountains that spill into the pool, creating a beautiful focal point for the well-appointed backyard. 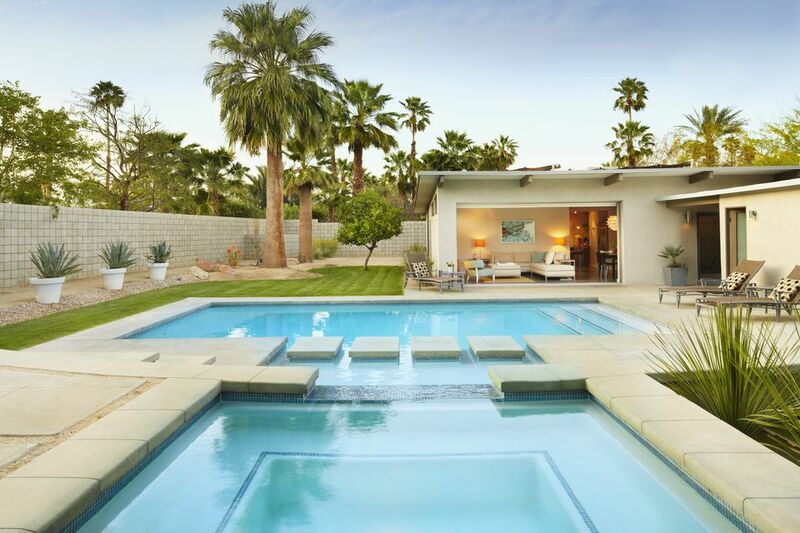 A sleek, mid-century modern house in the desert has a long, cool pool to echo the lines of the home's roof and covered patio. This pool with surrounding wooden deck is made by the French pool-building firm Diffauzer Piscenes and is made of watertight reinforced concrete. Most of the company's pools are constructed of concrete and are available in a variety of coatings. A zero-entry rectangular pool with connecting spa blends seamlessly with the tile pavers, making the backyard all about the view of the adjacent lawn and boat launch. From Aqua Technics' Caprice line, this rectangular pool measures 26 x 10 feet and features an azure blue finish. The outdoor entertaining area, kitchen, and lounge was built at the same time as the pool and spa and features wood ceilings that match the pool and spa decking. This San Antonio, Texas-area pool environment packs a lot into a small amount of space, offering its owners privacy while still offering views. Materials were chosen to reflect the natural environment and are rich, deep brown stones and mosaic tiles that complement one another. Just off the exercise room is a pool, with spectacular views. This courtyard pool in Australia is nestled perfectly between the gym and the house for easy access. Built about 10 feet from a ship channel on the Texas coast, this pool and spa blends with the coastal architecture. Materials used include travertine decking, glass tile in the pool and spa, exposed aggregate interior finish, and fire bowls on the zero edge. The environment comes alive at night with LED lighting. A courtyard pool and adjacent spa is the focal point of the yard and can be accessed from several rooms that surround the flagstone patio. A long, narrow, rectangular pool blends with the landscape on the Indonesian island of Bali. Jeda Villa is one of several for rent in the town of Pemurteran, which is located on the northwest corner of the island. The pool is situated on a raised wood deck with lounge chairs and surrounded by native trees, solar panels, and a breathtaking view of the nearby mountains.